Published on 18 September 2012. 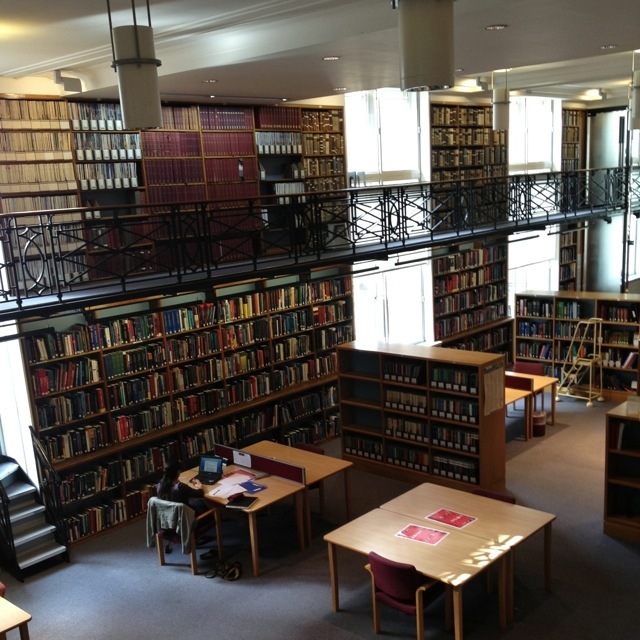 This is a tiny bit of the Royal Society of Medicine’s incredible library, which is one of the biggest medical libraries in Europe. It’s spread over four floors, holding over half a million volumes – with around a thousand new ones added each year. It holds books dating back to the 1400s – when the occasional outbreak of Black Death was still claiming the lives of young Londoners. Even I couldn’t resist pulling a book off the shelf and reading for a while. I think bringing Wendy here would be dangerous: she’s can easily spend an hour looking at the fairly pitiful selection of medical books in our local Blackwell’s, and has even taken her mum to the BMA library when on holiday! If I brought her here, she might move in… especially if she knew there’s a Mango nearby! This 1,814th post was filed under: Health, Photo-a-day 2012, London, Medicine.